We’ve officially said goodbye to summer here in Northern Michigan, but this styled shoot at the Kirby House in Saugatuck, Michigan makes it feel like it’s not too far from us. The amazing Sarah Rhodes Boyce planned and organized a shoot dripping with personality and tropical sentiments that make the warmer weather feel, at least, visually attainable. From the moment that I was sent the color palette, my mind immediately thought of Mexico and the naturally rich colors of the country. I’ve always been inspired by Otomi fabric patterns, and this seemed like the perfect opportunity to creatively explore. The suite that I created for the shoot is anchored by the invitation, featuring an Otomi inspired ombre watercolor pattern. A sheer printed vellum layer with the wedding details acts as a bold accent against the dreamy illustration. Along with the invitation, the rest of the suite is modern and minimal while still being playful and bright. I especially love the guest address detail on the main envelope. Something as simple as a small printed half-wrap adds dimension and texture without being over the top. While incorporating different shades of pink throughout the suite, we also accomplished a sense of levity and lightness that lends to the general aesthetic of the suite as a hole. The color palette for this shoot was truly inspiring and led us to have so much fun creating this suite! 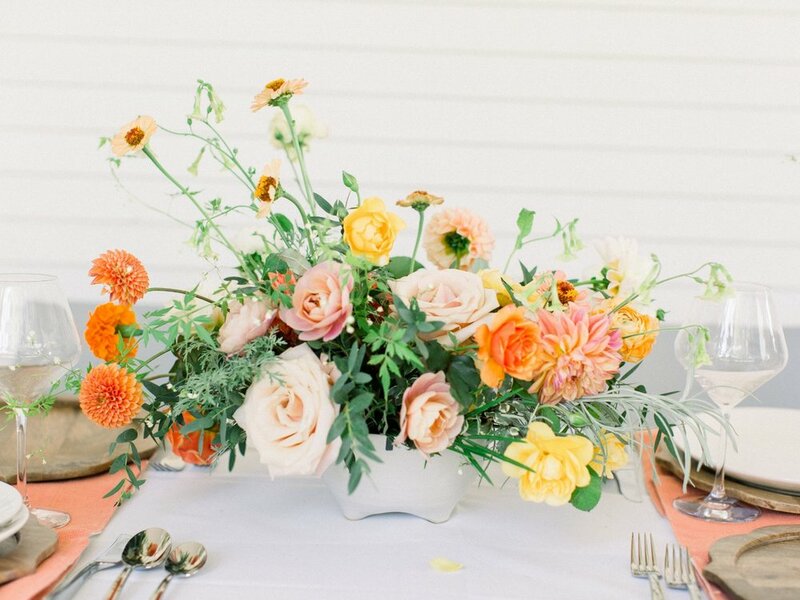 All of the floral arrangements, designed by Windflower Design Co., are punchy and organic and bright and unique. Each arrangement, from the luscious bouquets to the epic (can we use epic? do we care if we can’t?) staircase display shown above, completely sets the tone for the entire shoot. Working on the designs for this shoot was a wonderful creative outlet, allowing me to explore the use of patterns and color palettes that are outside of what I’ve been working on lately. As I shift into working on suites for the summer of 2019, I’m hoping to carry over some of this tropical energy. 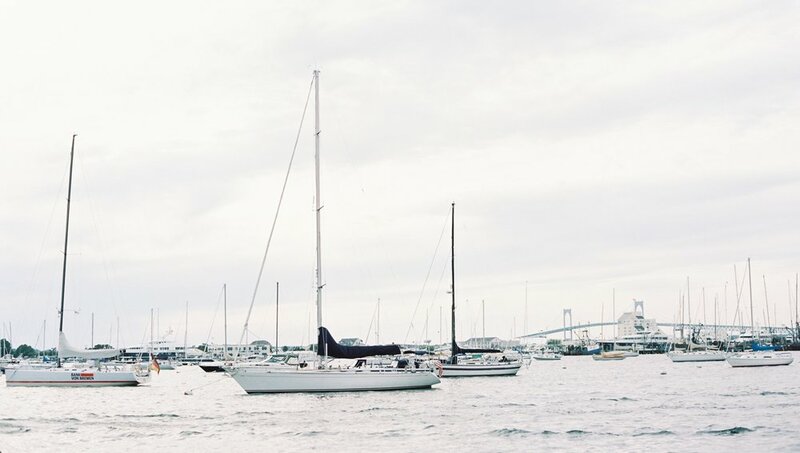 When I think of Rhode Island, I think of crushed oyster shells, a cool salty wind, the texture of weathered dock wood. New England has such a vast mix of historical and natural beauty, that it seems there could be no better place to tie the knot. The Newport backdrop for Meghan and Brian’s wedding was the perfect inspiration for the colors and textures that we used for their stationery pieces. 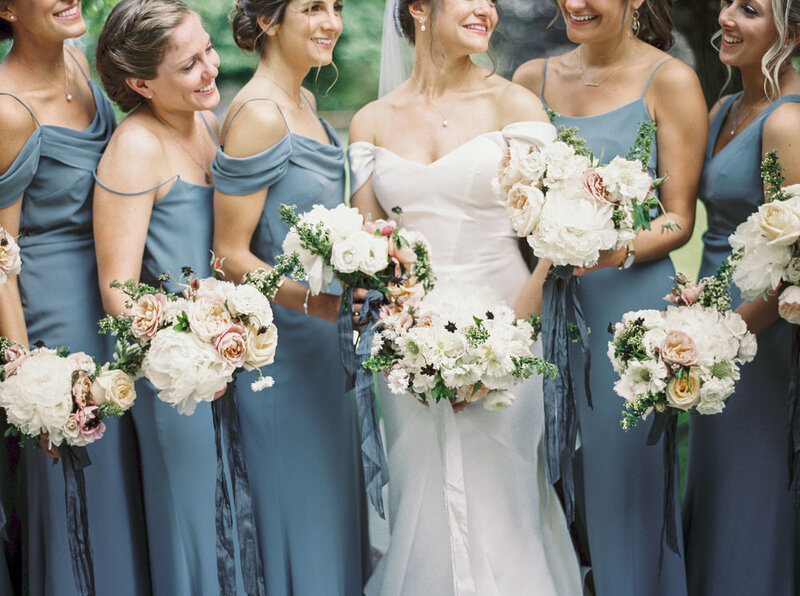 Soft blue-greens, silver, and peachy orange accents. Meghan’s vision for her suite and day-of pieces was unique in that she wanted to combine elements of the coast and wedding location, while keeping a sophisticated and minimal aesthetic in tact. For her custom suite we used a combination of silver foil printing and warm, peachy watercolor illustrations on the invitation, with floral and blue-greenery watercolors subtly incorporated on the insert pieces. The combination of colors and textures is exemplified beautifully on the day-of thank you tags (pictured above). 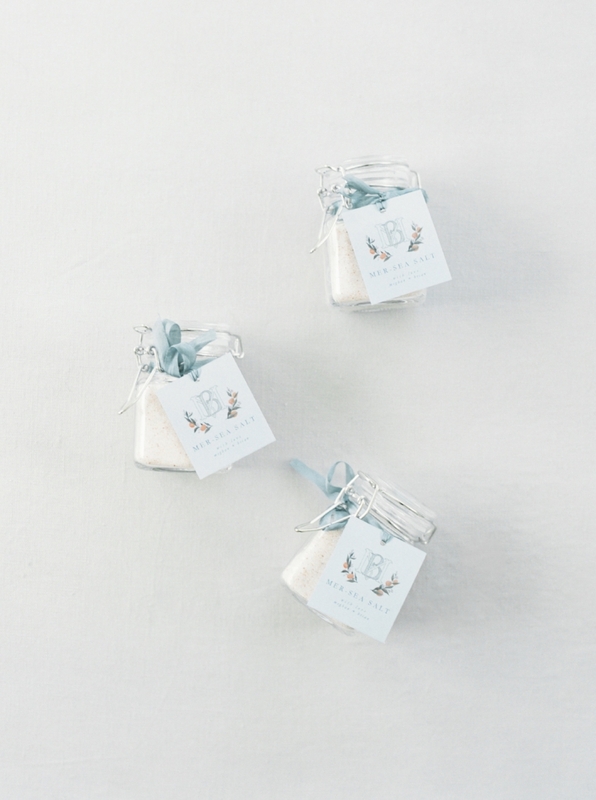 I think the little jars of sea salt as thank you favors is such a brilliant idea. Just the right seaside touch without being too nautical. We love all of the different ways that Meghan used versions of her custom crest throughout her wedding. Our favorite was how she had the crest custom printed onto pillows (pictured above) that sat comfortably in a lounge-like part of the reception. 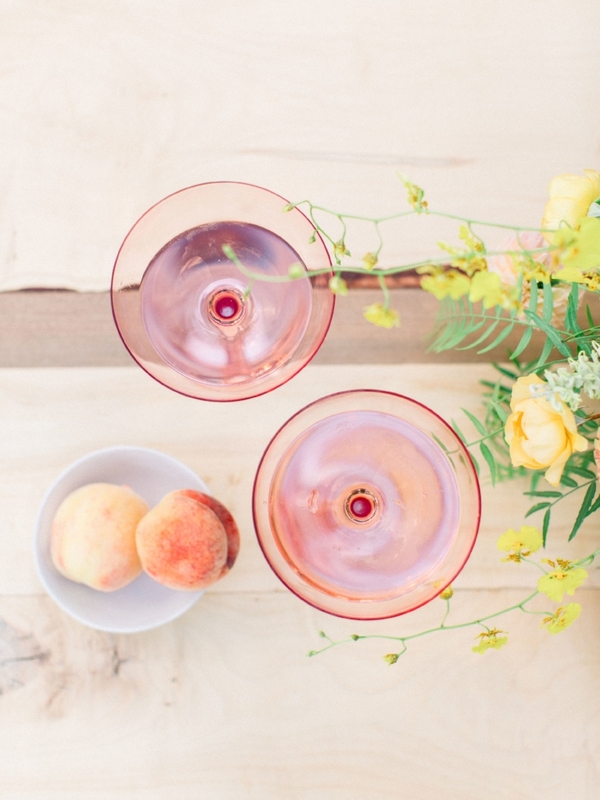 Elements like this are what make weddings not only personal, but cozy and intimate as well. 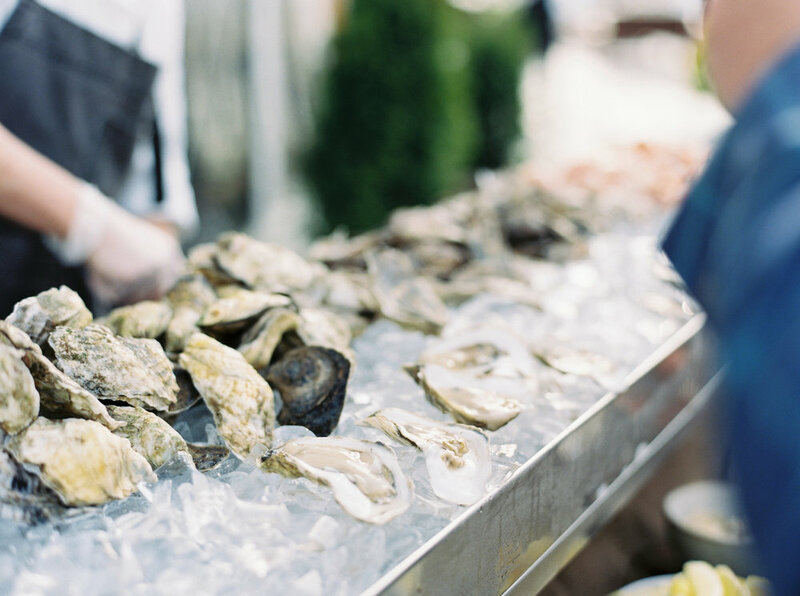 Can we just virtually snag one of those oysters or what? After looking through all these photos and posting this blog, I’m getting a craving for fresh seafood and saltwater adventures. I think that hunger is a testament to how beautiful and dreamy Meghan and Brian’s day turned out. A perfect balance of taking in the coastal surroundings and incorporating personal and sophisticated details.